It is impossible not to cry with the story of Chi Chi (love in Korean), a puppy labrador that lost its four paws after being the victim of a company meat in South Korea, according to the Association ASSEMBLE (Animal Rescue Media Education). In asian countries, such as Korea and China, dog meat is considered a delicacy equivalent to caviar in Spain. Even in these governments there is no animal protection law. 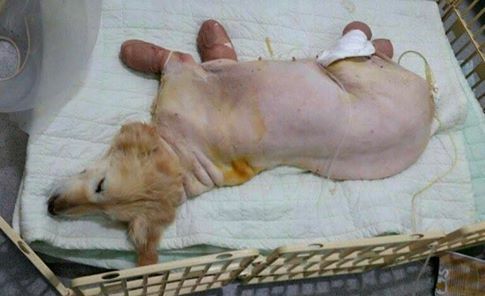 The dog was tortured in a dark room, hanging by the legs upside down so that his flesh was “more juicy”. He remained so long in this position that the ropes began to embed itself in your skin. As its legs were rotted, Chi Chi because he was not ‘edible’ and decided tothrow it in a rubbish bin, tucked in a plastic bag. However, life gave him a second chance. The humane Korean, Nabiya Irion Hope, they were there because that was an area known for the sacrifices of animals. The canine was found by chance , and quickly was put in touch with theAssociation ASSEMBLE to save her. 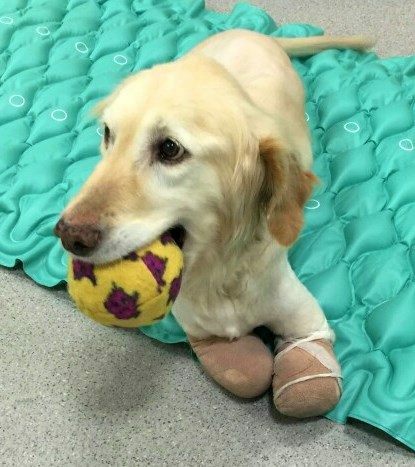 The dog had to be operated emergency , and, due to the serious infection that he suffered in all his limbs, had to proceed to amputation to survive. Luckily, both associations designed ornas prosthesis for the puppy to return to walk. Today, Chi Chi has no fear of humans, but rather the opposite. It is a happy, affectionate and playful. Even it is outstanding to travel to Arizona to meet her new family, the Howells.